At Indiana University South Bend, you receive the personal attention of a smaller campus combined with the resources of Indiana University. Your decision to enroll at IU South Bend gives you a wide range of options – degree choice, class scheduling, research, and internships. Monday – Thursday: 8 a.m. to 5:30 p.m.
See the IU South Bend campus and all it has to offer first-hand. IU South Bend allows students the opportunity to fulfill their potential and earn an Indiana University degree at an affordable cost. Indiana University South Bend is committed to ensuring a quality education for all students in the Michiana Region. Not only do we offer exceptional educational opportunities here at IU South Bend, but we also have a remarkable partnership with Ivy tech Community College. Together, we believe we have what it takes to serve the students of Michiana. 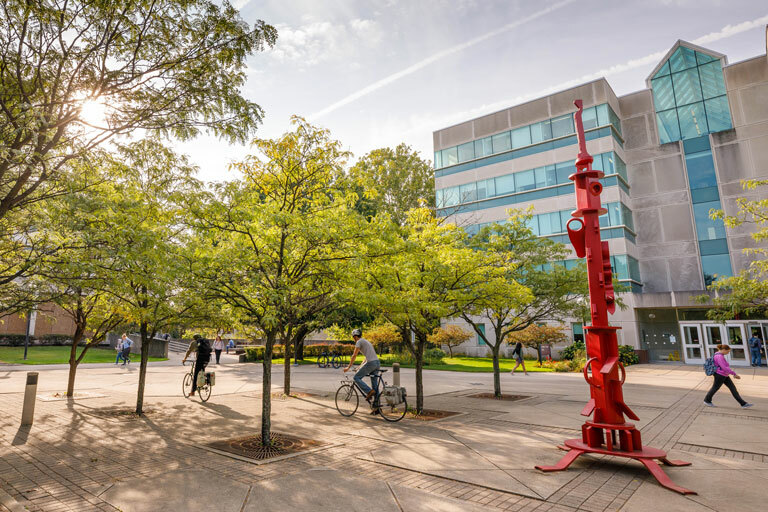 High School Counselors, when you refer your high school students to IU South Bend, you can be confident you are recommending an institution that is one of the region’s foremost universities, a campus that offers the complete college experience. We offer more than 100 majors as well as robust graduate and distance learning programs.